(by Rachel Lucas, WSLS 10) – A new survey highlights overwhelming misconceptions current U.S. college students have about their student loans, including the fact that they will actually have to pay them back. In a time when Americans are burdened by student loan debt more than ever, it’s an alarming trend that college loan finances are perplexing the next generation. Americans owe nearly $1.3 trillion dollars in student loan debt, spread out among a 44.2 million borrowers. According to Student Loan Hero, the average Class of 2016 gradate has $37,172 dollars in student loan debt. That number is up six-percent from last year. The student loan delinquency rate is 11-percent. According to the survey of 500 college students by LendEDU, a private firm that connects students and their families with student loans and loan refinancing, almost half of those responded that they believe they would be able to receive federal loan forgiveness on their student loans after graduation. Despite the overwhelming misconception, student loan forgiveness takes time, is only open to certain professions and is absolutely not guaranteed. 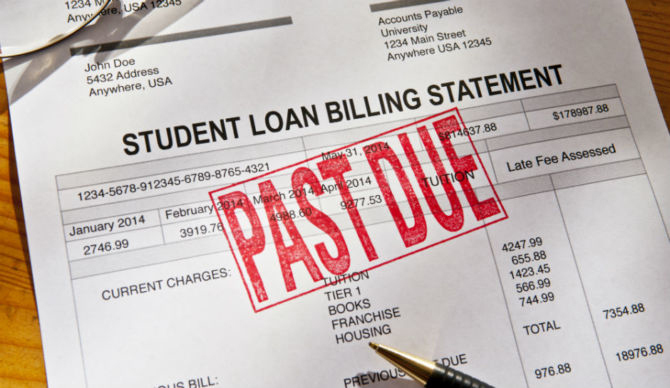 According to the US Department of Education guidelines, student loan borrowers can be forgiven of their debt only if they enter a profession considered to be a public service for a specific period of time. Usually that time period is ten years. Student loan forgiveness is usually available for public teachers who agree to teach in an underserved area. Other reasons for forgiveness include death or permanent disability. Definitely not something students should bank on. In a summary, LendEDU says the survey confirms that college students don’t understand the basic financial aid process. “The full results of our survey are quite eye-opening,” LendEDU noted. Although the survey shows that 49.8-percent of college students think they qualify for student loan forgiveness, most do not. According to the U.S. Department of Education, those who do qualify will still have to make 120 consecutive payments before their loans will be forgiven. Not only does the survey show that almost half of college students think they’ll be forgiven, it also indicates that 80-percent of college students could not identify their exact current federal student loan interest rate. That’s like having a credit card, auto or house payment and not knowing the difference between the principal balance and how much interest has accrued. The survey also shows that most college students rely on their parents for student loan information when in fact, it’s quite possible parents don’t fully understand the process either. “It is concerning that current college students are underestimating the cost of student debt today and tomorrow,” LendEDU noted in the results. The full results of the survey as well as questions answered are listed below. Have you heard of the FAFSA? 90% of college students reported that they had heard of FAFSA. Do you know the deadline to file the FAFSA for the 2017-2018 school year? 84% of college students could not identify the correct filing deadline for the FAFSA. How much does it cost to file the FAFSA for the 2017-2018 school year? 16% of college students did not know how much it costs to file the FAFSA. Filing the FAFSA is free, but unfortunately, 16% of respondents reported a filing cost. 78% of college students could not identify what FAFSA stands for. What is included in the Expected Family Contribution (EFC) formula for the 2017-2018 school year? 42% of college students could not identify the components included in the EFC formula. What is included in the Cost of Attendance (COA) formula for the 2017-2018 school year? 75% of college students could not identify the components included in the COA formula. Do you know the difference between subsidized and unsubsidized student loans? 33% of college students could not identify the differences between subsidized and unsubsidized loans. What is the maximum Pell Grant award for the 2016-2017 award year? 80% of college students could not identify the current maximum Pell Grant award for the 2016-2017 award year within a +-15% margin of error. What is the current interest rate on new undergraduate federal subsidized and unsubsidized student loans? 80% of college students could not identify the current interest rates on undergraduate federal subsidized and unsubsidized student loans. Do you know the current repayment term of a federal student loan? 79% of college students could not identify the current repayment term of a federal student loan. Do unsubsidized student loans accumulate interest during deferment? When asked, 44% of college students did not know unsubsidized student loans accumulate interest during deferment. Do subsidized student loans accumulate interest during deferment? When asked, 57% of college students did not know subsidized student loans do not accumulate interest during deferment. Do you know the current federal student loan borrowing limit? 74% of college students could not identify the current federal student loan borrowing limits, relative to their current educational standing. Can Parent PLUS loans be transferred to you (the student) after you graduate from college? 57% of college students did not know that Parent PLUS loans cannot be transferred to the student after graduating college. Do you believe that you will be helped by federal student loan forgiveness programs after graduation? When asked, 49.80% of college students believed they would in fact be helped by federal student loan forgiveness programs after graduation. Is it possible to refinance student loan debt with the federal government? When asked, 64% of college students incorrectly believe that it is possible to refinance student loan debt with the federal government. Reprinted here for educational purposes only. May not be reproduced on other websites without permission from NBC’s WSLS10. Visit the website at WSLS10 .com. 2. a) How many Americans currently have Student Loan debt? b) How much money does this total? 3. a) What did student loan firm LendEDU discover about college students’ beliefs about repaying their student loans? b) What did LendEDU discover about college students’ knowledge of the current federal student loan interest rate? 4. a) List those who are eligible for student loan forgiveness. b) What must students who qualify for student loan forgiveness do before their loans will be forgiven? 5. What does LendEDU say their study confirms about college students understanding of financial aid? 6. a) Read the LendEDU survey questions at the end of the article. How many did you know the answer to? b) What should every student who reads this article do? Be specific. Read the original LendEDU survey.